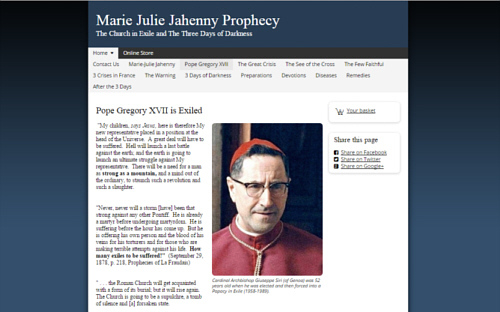 TCW was informed that a new website on the holy Catholic mystic Marie-Julie Jahenny's prophecies (called MJJProphecy.com) has been launched. The site has the approbation of the Hierarchy in exile, and provides much valuable information on how to prepare for/survive the upcoming 3 Days of Darkness world-wide chastisement. Please help!! For the blessing today where do i get hawthorne leafs? We advise for TODAY to buy an inexpensive hawthorne plant at a local nursery. Also you may find the leaves at health stores. Can you say what the owner of this site on Marie Julie Jahenny next site this month will be about? Not at this time. They have mentioned two interesting subjects. We will keep you posted. Wonderful website of MJJProphecy.com, job well done..thank you and God Bless.